When winter comes, you make a lot of changes to your routine – in everything from clothing to food. Your skincare should also adapt to the change in season. Here are five common bad skincare habits to break for happy, healthy skin as the cold sets in. Sure, we don’t have to worry much about sun glare off the snow here in South Africa, but even on cloudy days those harmful rays can get to you. Some experts say you can blame about 10 percent of facial wrinkles on your genes – the rest are caused by sun damage. So invest in a good sunscreen, beauties. Sunscreen is also a weapon against redness, age spots, sagging and melanoma. Even in the heart of winter, apply at least an SPF30 on exposed skin like face and hands about half an hour before going out. Pick a broad-spectrum product that covers you against the burn of UVB rays and the tanning of UVA rays. If you can’t stand turning as pale as a button mushroom, try mineral powders for a glow or a moisturiser or primer with a tint. Getting rid of dead cells clears the way for moisturisers to sink into your skin. But bear in mind, scrubbing isn’t an extreme sport and especially in winter, harsh products can damage the skin’s natural protective barrier. If it stings or your face goes red, the exfoliator is probably too harsh. 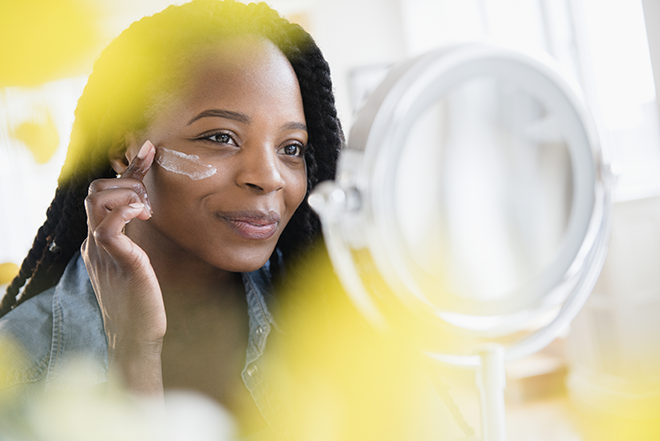 Ask an expert to help you pick products that work well together and make sure there aren’t exfoliating elements in every step of your routine. A piping hot bath or a steaming shower will warm you up but is your skin’s worst winter nightmare. The hot water strips natural oils from the skin, drying it out and making it more vulnerable to enemies like eczema. A luke-warm bath with oatmeal or baking soda relieves skin that is itchy and dry. If you must have the heat, make it quick and save your skin afterwards with a moisturising oil or Shea butter. Your face suffers most under a scalding shower, so calm it down after the trauma with a hydrating face oil. Winter is like a change in your natural habitat, with lower temperatures, artificial heat and dry air indoors. The summer skin routine doesn’t fit. If you’re using a gel cleanser, switch to a milder one or – even better – a cream cleaner and don’t wash too often. Replace lightweight or oil-free moisturisers with creams, which draw additional moisture into the skin. Skin that’s feeling the pinch of winter won’t love a woollen sweater as much as you might. Scratchy clothes on sensitive skin will cause more irritation and even inflammation. Try soft cotton as a first layer and wash clothes in detergents with no fragrance or dyes. Fabric softeners can add to the problem, so avoid those too. As always, picking and scratching makes it worse and can cause something like allergic contact dermatitis. Try a cool compress for relief. Mmm, I’m guilty of the piping hot baths, it’s just so cold and the bath is so nice and hot, I do add oils to the bath though. One thing I never skip even when I’m sick and that is applying my sunscreen every day of the year. Haha i’m guilty of most the above lol I need to take better care of my skin! Guilty of skipping sunscreen even in summer, this is a habit I seriously need to kick. I am guilty of pretty much all these lol.